The world has been through a dramatic and fascinating period since the global economic crisis erupted in 2008. While the wealthy, developed nations of the North have been pitched into one crisis after another, the countries of the global South (many of whom are well accustomed to crises) have been part of a powerful new economic phenomenon: the rapid growth of South-South trade, investment and exchange. Its effects include stronger ties between Asia and South America and between China and Africa. South-South trade is the great economic success story of the past decade. World Trade Organization (WTO) (www.wto.org) figures show South-South trade grew to 16.4 percent of the US $14 trillion in total world exports in 2007, from 11.5 percent in 2000. While the global economic crisis has slowed trade down, the overall trend for South-South trade and connections seems firmly established. South-South trade made up 20 percent of global exports by 2010, and foreign direct investment to developing economies rose by 10 percent in 2010 due to a rapid economic recovery and increasing South-South flows. Trade between China and Africa has surged during the decade since China joined the WTO in 2001, from around US $10 billion in 2000 to US $73.3 billion in 2007, a year-on-year increase of 32.2 percent. By 2008, it had soared by 44.1 percent to reach a record high of US $106.84 billion, according to Zhang Yongpeng of the Institute for West Asian and African Studies (IWAAS). This jump in investment has also had its downside: coming fast and furious as investment cash chases better investment profits in the global South, it has pushed up inflation and commodity prices and spawned property speculation bubbles. This, as can be seen across North Africa and the Middle East, can lead to political and social instability. A review of the big trends bubbling under the surface in 2011 shows how important South-South exchange will be in alleviating poverty and improving lives in the run-up to the 2015 Millennium Development Goals (http://www.un.org/millenniumgoals/). It also shows up the dangers inherent in this new environment – rising inflation without economic growth can crush the poor. A focus on innovation and new thinking will be necessary to get through this year and beyond. – Inflation: In 2011 it looks like we will hear a lot about inflation. As the global economy tries to stabilize and return to growth, there will be inflation surges for a wide variety of reasons. People will need strategies and new techniques to make sure they can afford the necessities of life. This will be critical if development gains from the past decade are not to be lost. – Super cycle: Some are putting forward the theory we are entering a ‘super cycle’ (http://www.bloomberg.com/news/2011-01-23/super-cycle-leaves-no-economy-behind-as-davos-shifts-to-growth-from-crisis.html) created by better connectivity, global travel and mobility and the ease of moving around investment to create businesses and jobs. The super cycle theory claims that this will spark the greatest period of human development in history – raising all national economies – as more and more people benefit from rising living standards and opportunities. – Switch to South-South trade: With the trend of increasing South-South trade now firmly established, there is a greater awareness now of the power of sharing ideas across the South. One example of this idea-sharing is the annual Global South-South Development Expo (http://www.southsouthexpo.org/) run by UNDP’s Special Unit for South-South Cooperation Unit (http://ssc.undp.org/). – New technologies: The spread of new technologies around the world will continue and bring many changes. Africa is seeing increasing access to high-speed Internet as new undersea cables are laid around the continent. Mobile phones will continue to be a critical tool for many to stay in touch and boost incomes. 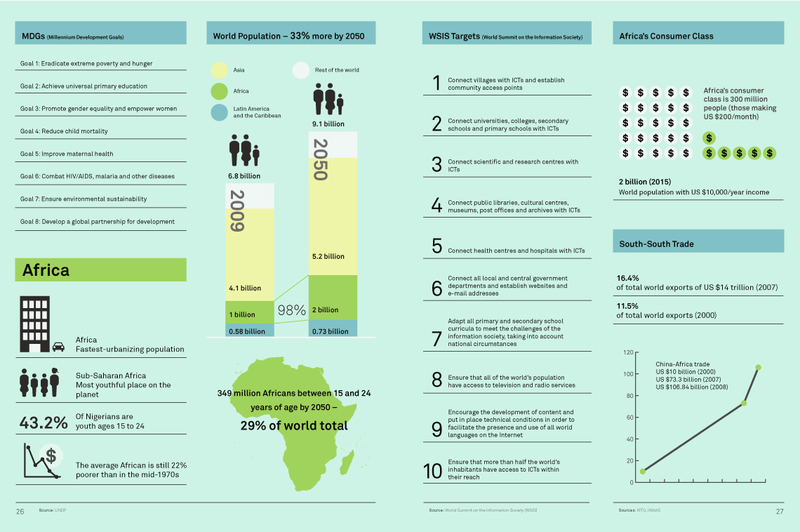 – MDGs on horizon in 2015: The Millennium Development Goals (MDGs) target of 2015 is just four years away. This will face the headwinds of the global economic crisis and urgent attention will be needed to make sure gains are not lost as 2015 approaches. The role played by South-South trade will be a critical partner in aiding goal achievements. – Cities: A surge to the urban was pronounced by 2007 and we are now living in a majority urban world. Innovation and sharing experiences and knowledge will play a key role in ensuring this is not a disaster. A recent book, Arrival City by Canadian journalist Doug Saunders, detailed this urban surge occurring across the global South, the largest movement of people to cities and urban and semi-urban areas in human history. It follows the pattern that was seen in Europe in the 19th century, as economies change and people seek the new opportunities promised by cities, or find rural economies unsustainable. – The China model of development: The big talking point will be China’s economic model for eradicating poverty on a mass scale. A new book by Dambisa Moyo, How the West Was Lost: Fifty Years of Economic Folly – And the Stark Choices Ahead, investigates the mistakes made in developed, Western nations and what can be learned from the experiences in the global South. – Food crisis: At the beginning of February, the Food and Agricultural Organization (FAO) issued a warning about the risk of a new global food crisis after its food price index reached a record high in January 2011. The FAO also issued an alert about severe drought in China, the world’s largest wheat producer. Flooding in Brazil and Australia have also devastated crops, much of which are exported to countries across the South. There is also risk to crops from flooding in southern Africa. Wheat, corn and soybean prices are rising, and prices reached a peak just as they did in 2008 (FAO). Even developed countries normally used to food surpluses are at risk. In the US, corn reserves are at a 15 year low (US Department of Agriculture), and the price of corn has doubled in past six months. A billion people go to bed hungry every night; someone starves to death every 3.6 seconds – 75 percent are children under five, according to the World Food Programme (http://www.wfp.org/1billion).